361 Degrees Spire 3 has just been released by 361 Degrees. Our experts are working on a detailed review. Please, come back later. 361 Degrees Spire 3 - The underestimated underdog? 361 Degrees is a fairly new brand on the European market. But they are already a well-known brand in China. I had heard of them before, but I hadn’t tried any of their shoes yet. So, when I had the chance to try their new Spire 3, I obviously said yes. The 361 Degrees Spire 3 is a neutral running shoe with a 9mm drop, a 12mm forefoot stack, and a 21mm heel stack. It weighs 241 grams. Surprisingly, those are the same statistics as that of the 361 Degrees Sensation 3, although that one weighs 238 grams. The difference between the two models seems to be in the amount of Qu!kfoam used and the Sensation 3 is a stability shoe rather than a neutral running shoe like the Spire 3. Qu!kfoam is an EVA foam and rubber blend that 361 describes as cushioned and responsive. While the Sensation 3 comes in an array of bright colours, the colours of the Spire 3 are a bit more subtle. But I do actually like the look of them. The Spire 3 has a seamless knit upper and I haven’t experienced any hotspots while running in them. The Fitz-Rite Midfoot technology wraps around the midfoot to provide stability and keeps the foot locked in place while running. It eliminated unnecessary movements of the foot while running. There is ample room in the toe box, but it isn’t super roomy. The tongue is slightly padded and has a bit of a velvet kind of feel to is, just as the laces of the shoe. However, I do find the tongue too short. If you lace your shoes all the way up to the top or even use the extra shoelace hole, the laces end up higher than the tongue. I found that the upper was actually a bit warm, which I actually didn’t mind during those colder runs. At least my toes didn’t get cold. I did find that the top layer of the upper does take up a bit of water while running in wet conditions, but the smoother second knit layer seems to prevent the water from actually getting into the shoe. Obviously, the knit fabric won’t keep your feet dry in a rainstorm (the shoe also doesn’t have a drainage system so your feet will definitely get wet), but it also doesn’t seem to soak up all the water as some other shoes do. I found the heel counter to be nice and comfortable, with a nice amount of padding on the collar of the shoe. I did not experience any hot spots in the heel area of the Spire 3. The midsole contains a carbon fiber plate which 361 Degrees calls the Qu!k Spine. This made me think of the carbon fiber plate in the Nike Zoom Vaporfly 4%, which is there to capture the energy and then return it back to you. Only 361 Degrees seems to use this feature more for stability purposes rather than energy return. The shoe also doesn’t feel super responsive or that it would be capable of making you run 4% faster (I wish). The outsole of the forefoot is made out of blown rubber, while the heel is made of carbon rubber. It does provide a nice amount of traction on the road and the shoe does perform alright on easy trails. The front of the shoe has a slight rocker shape that helps you toe off, but the sole itself isn’t very flexible. This could probably be fixed if they would put flexibility grooves over the entire width of the sole. The Spire 3 actually reminded me a bit of the older type of running shoes, before brands came up with interesting sounding new materials and flashy new designs. The design is pretty sleek and simple, and although the midsole does absorb the shock it does have quite a firm feel to it and isn’t that flexible. It doesn’t feel like a very plush ride, you don’t sink into the material, probably due to the amount of rubber in the sole. The insole is surprisingly thick. It also seems to be made out of Qu!kfoam. 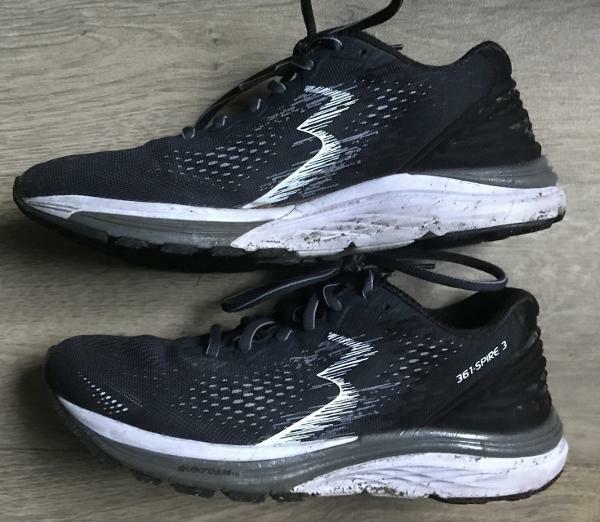 Probably in order to provide extra stability and cushioning, while trying to keep the bulk of the shoe to a minimum, but it does leave you less space inside the shoe, especially in the front. I like the overall stability of this shoe, the structure of the shoe gives you enough lateral stability, while the insole provides good medial stability. The Spire 3 isn’t a very wide shoe, but it does have an upper that does adapt easily due to the knit fabric, so the width of the shoe didn’t form an issue and I didn’t experience any hotspots in this shoe. I wore my regular size. The Spire 3 is actually a very comfortable shoe and I actually could see myself run a marathon in them. And there actually aren’t that many running shoes on the market in which I would consider running a full marathon. The Spire 3 is a neutral running shoe, but if you need a little bit of extra support, the Spire 3 will give it to you. It provides enough medial and lateral support. The Spire 3 has a nice seamless upper and good stability, but there are still things about this shoe that I would change if I had the chance. The shoe does have a nice amount of cushioning but is also quite firm. Personally, I would prefer it if the shoe would feel a bit plusher and a bit more flexible. And although the responsiveness of this shoe is good, it isn’t great and therefore it also isn’t a super fast shoe. Not like the average Nike running shoe. It is a comfortable training shoe, but not a fast racing shoe. All in all, I was pleasantly surprised by this shoe and I am looking forward to trying out other 361 Degrees products in the future. Right now the product is good, but 361º lacks a personality. Overall, our wear-testers who liked a firmer ride gravitated toward the Spire, and believed there was ample comfort for everyday training and long runs alike. This shoe is an ideal a long run shoe, but a little on the clunkier side for track use or speed work. This would be a great shoe to have in rotation with something a little lighter and less cushioned for your top-end workouts. The 361 Degrees Spire 3, a road running shoe, maintains its position in the 361 line up. It is crafted for those who have neutral foot mechanism. With the utilization of the revamped upper, increased comfort is provided without compromising its lightweight structure and breathability. The midsole was redesigned to improve cushioning during the heel impact. With the use of this midsole material, improved responsiveness in the forefoot area is offered. When it comes to size, the 361 Degrees Spire 3 uses the standard running shoe length. It is sure to provide a snugger fit because of the utilization of the engineered mesh upper. A more comfortable ride is then experienced by the user. The available widths are B – Medium for the women’s version and D – Medium for the men’s version. The Blown Rubber is integrated into the forefoot area of this road runner. This component of the footwear is essential in allowing a better shock dispersion. The material also provides a good amount of traction when tackling different paved surfaces. Lying in the heel area is the Carbon Rubber. The primary focus of this rubber is to give added durability to the platform. With the utilization of this material, the 361 Degrees Spire 3 can withstand the hazardous nature of the roads. It is also vital in protecting the bottom part of the shoe. A forefoot design called the QU!K Flex is used in creating the shoe. It is composed of a ground-contact external base and a network of grooves. This technology is crafted to help in allowing the foot to achieve a more energized and steady heel-to-toe transition. A full-length midsole top layer called the QU!KFOAM is integrated into the 361 Degrees Spire 3. It is strategically-built to provide a soft cushioning system that is closer to the foot. This dense rubber compound aims to deliver maximum responsiveness during the toe-off phase. With its thick-looking structure, it produces the right amount of bounce that is needed when tackling the roads. Flexible underfoot cushioning is offered by the Rebound EVA. This material has the purpose of delivering a more responsive and comfortable ride. As a result, a more efficient running experience is provided to the user. Efficiency is encouraged by the QU!K Spine. This carbon fiber plate that can be found in the midfoot section provides increased torsional rigidity. This material acts as a shank that aims to delay the breakdown of the midsole section. It also works as a stabilizing element in the midstance phase of the gait cycle. As a result, a more efficient stride is experienced by the runner. Utilized in the upper section of the 361 Degrees Spire 3 is the Engineered Mesh. This material provides comfort without compromising its breathability. It is described to be a flexible and soft mesh that offers better inflow and outflow of air. Because of this, a cooler and drier foot chamber is experienced by the runner. As a result, a healthier and fresher interior is provided. The 361 Degrees Spire 3 uses the Fitz-Rite. This technology is defined to be a soft midfoot webbing that aids in holding the foot in place. It is composed of internal and external webbing that securely wraps the foot in the Spinject. This Fitz-Rite Midfoot technology is essential in preventing the foot from moving side to side during the running session without sacrificing its natural movements. A lightweight molded heel counter is utilized in the footwear. It keeps the heel in place in a comfortable manner, especially in every step that the runner does. Limiting irritation is the work of the Pressure Free Tongue. As a result, additional comfort is experienced by the user.